This is a Jean-Georges Vongerichten recipe, simple and elegant and exactly how I like to cook and eat. The fried rice itself has but three ingredients: oil, leeks, and rice. 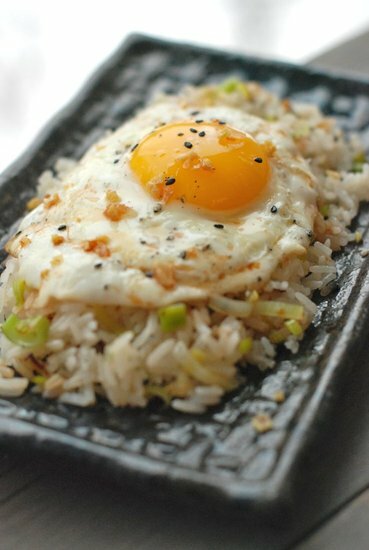 You wouldn’t expect just rice and leeks to be so addictive, but they are, particularly when topped with a fried egg, particularly when topped with crispy ginger and garlic. A drizzle of soy sauce and sesame oil to finish makes the whole completely sublime. If you make an effort to keep leeks around, count this as a perfect quick dinner when you invite someone over and forget to swing by the store to pick up ingredients. I don’t often find myself with leftover rice, so I make a fresh batch and cool it on a baking sheet before continuing; works perfectly. This looks great. I think I've got all the ingredients in the kitchen right now! Wow! This looks SO good. I am never one to turn down an egg dish. Mmmmm! I made this recipe a few weeks ago, and my husband has proclaimed it his new favorite. I'm so glad you reminded me . . . now I know what I will be making tonight!